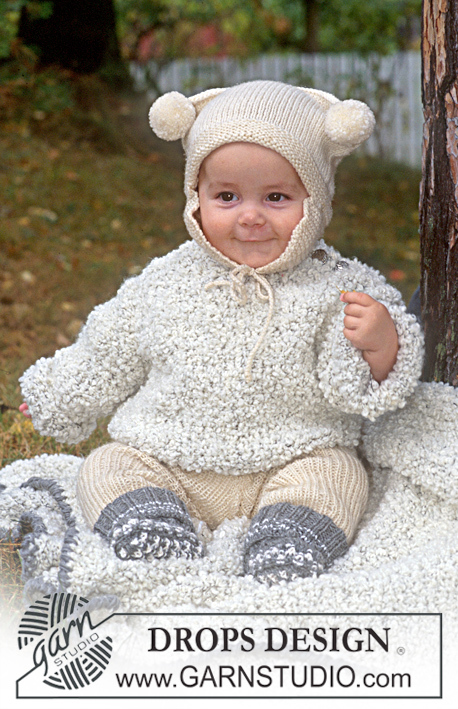 Go to original pattern for design DROPS Children 9-24. Size in cm: 50/56-62/68-74/80 (86/92-98/104-110/116). DROPS eedles size 5 mm. DROPS button: Tin-Troldknap, no 606: 2 pcs. Knitting tension: 11 sts x 18 rows on needle size 5 mm in stocking st = 10 x 10 cm. Remember needle sizes are guidelines only. Garter st back and forth: 1st row: K, 2nd row: K.
Front piece: Cast on 30-33-37 (40-45-46) sts loosely (incl 1 edge st each side for seam) on needle size 5 mm in Big Bouclè and knit 2 rows garter st. Continue in stocking st. Remember the knitting tension! When piece measures 19-20-23 (27-30-32) cm cast off for armhole each side on every other row: 2 sts 1-1-1 (1-1-1) time, 1 st 2-2-3 (3-4-3) times = 22-25-27 (30-33-36) sts. 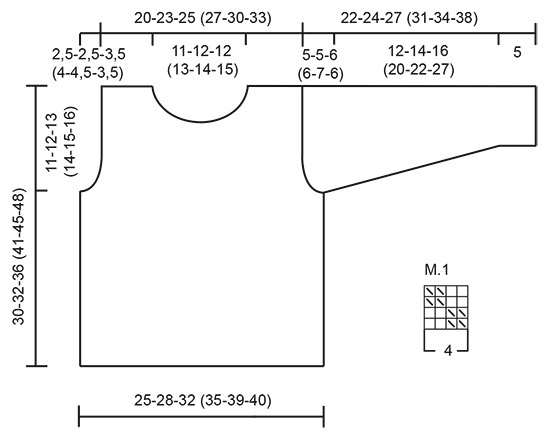 When piece measures 26-28-32 (36-40-43) cm cast off the middle 4-5-5 (6-7-8) sts for neck and dec to shape the neckline on every other row: 2 sts 1 time, 1 st 2 times = 5-6-7 (8-9-10) sts left on shoulder. Right shoulder: Cast off loosely when piece measures 30-32-36 (41-45-48) cm. Left shoulder: When piece measures 30-32-36 (41-45-48) cm, knit 2 cm garter st over shoulder sts – at the same time after 2 rows cast off evenly for 1-1-1 (1-2-2) buttonholes on shoulder: 1 buttonhole = cast off 1 st, yo over cast off st on next row. Cast off loosely when piece measures 32-34-38 (43-47-50) cm. Back piece: Cast on and knit like front piece. Cast off for armhole as described for front piece = 22-25-27 (30-33-36) sts. Continue until piece measures 28-30-34 (39-43-46) cm, cast off the middle 10-11-11 (12-13-14) sts for neck and dec 1 st on neckline on next row = 5-6-7 (8-9-10) sts left on each shoulder. Left shoulder: When piece measures 30-32-36 (41-45-48) cm knit 2 cm garter st over shoulder sts. Cast off loosely when piece measures 32-34-38 (43-47-50) cm. Sleeve: Cast on 21-22-23 (24-25-26) sts loosely (incl 1 edge st each side for seam) on needle size 5 mm with Big Bouclè and knit 2 rows garter st. Continue in stocking st. At the same time when piece measures 5 cm inc 1 st each side: 2-2-3 (3-4-5) times on every 6.-7.-5. (6.5-5.5-5.) cm = 25-26-29 (30-33-36) sts. When piece measures 17-19-21 (25-27-32) cm cast off for sleeve cap on every other row: 2 sts 2-2-2 (2-2-2) times, 1 st 1-1-2 (2-4-1) times, then cast of 2 sts each side until sleeve measures 22-24-27 (31-34-38) cm. Cast off. Assembly: Sew right shoulder seam. 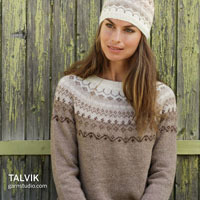 Gather approx 36-50 sts up round neckline – from opening on left shoulder – on needle size 5 mm with Big Bouclè. Knit 3-3-4 (4-5-5) cm garter st – at the same time cast off for 1 buttonhole after 1-1-2 (2-3-3) cm in line with the other(s) on shoulder. Set in sleeves and sew sleeve and side seams. Sew on buttons. Knitting tension: 9 sts x 16 rows on needle size 7 mm = 10 x 10 cm. Remember needle sizes are guidelines only. Knit blanket back and forth on circular needle. Cast on 68 sts on needle size 7 mm with Big Bouclè. 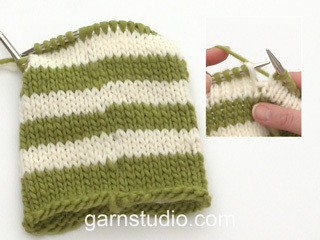 Knit 2 rows garter st, continue in stocking st – garter st the 2 edge st on each side. When piece measures 89 cm, knit 2 rows garter st over all sts. Cast off. Crochet edge: Crochet a row of lobster sts with crochet hook size 5 mm and 2 threads of grey Karisma round the entire blanket. Lobster st: Crochet dc from RS, but from left to right. Crochet approx 12 lobster sts on every 10 cm. Leg length: 18-22-25 (27-35-41) cm. DROPS circular needles and double pointed needles size 2.5 mm and 3.5 mm. Knitting tension: 22 sts x 30 rows on needles size 3.5 mm and stocking st = 10 x 10 cm. Remember needle sizes are guidelines only! Rib edge: * K1, P1 *. Repeat from *-*. Right leg: Cast on 50-54-56 (60-62-64) sts on double pointed needles size 2.5 mm in off white and knit 3 cm rib. Change to double pointed needles size 3.5 mm and continue in rib. At the same time inc 2 sts on inside of leg: 6-4-7 (7-8-9) times on every 2-3-2 (2-2-2) cm = 62-62-70 (74-78-82) sts. Divide piece on inside of leg when it measures 15-19-22 (24-32-38) cm (= split to make it easier to slip legs onto circular needle later). Complete leg knitting back and forth on needle – at the same time inc 1 st on first row each side for seam = 64-64-72 (76-80-84) sts. When piece measures 18-22-25 (27-35-41) cm cast off 3 sts each side = 58-58-66 (70-74-78) sts. Leave piece to one side. Left leg: Knit like right. Trousers: Slip legs on same circular needle = 116-116-132 (140-148-156) sts. Insert a marking thread mid back and mid front and continue in rib – at the same time inc each side of the 3 middle sts mid back and dec on each side of the 3 middle sts mid front on every other row as follows: Inc 1 st 6 times. Dec 1 st 8-8-10 (10-12-14) times = 112-112-124 (132-136-140) sts. When piece measures 35-39-45 (49-55-61) cm change to circular needle size 2.5 mm. Knit 3 cm rib, P1 round (= folding edge), 3 cm rib. Cast off, turn edge double on top towards WS and sew on. Assembly: Sew split tog on inside of each leg up to the cast of sts and then sew opening between legs tog from mid front to mid back of trousers. Pull elastics through casting round mid riff. 50-50-50 (100-100) g colour no 21, mid grey. 50-50-50 (50 -50) g colour no 01, off white. DROPS double pointed needles size 2.5 mm and 3.5 mm. Pattern: See diagram - 1 diagram = 1 pattern repeat. Pattern is seen from RS. Knitting tension: 22 sts = 10 cm in width on needle size 3.5 mm and M.1. Cast on 48-52-52 (56-56) sts on double pointed needles size 2.5 mm with grey and knit 10-11-12 (13-14) cm rib as follows: 2 rounds grey, 1 round off white, 2 rounds grey, 1 round off white, then complete sock in grey. At the same time, when piece measures 4-5-5 (5-6) cm K 3 sts tog mid back, knit 4 rounds and K3 tog mid back once more = 44-48-48 (52-52) sts. Continue in rib. When piece measures 10-11-12 (13-14) cm change to double pointed needles size 3.5 mm and stocking st – at the same time dec evenly on round to 36-40-40 (44-44) sts. After second round knit next round as follows: * K2 tog, yo *, repeat from *-*. Knit 1 round stocking st. Remember knitting tension. Now slip 28-30-30 (32-32) sts mid back onto a thread. Continue in stocking st over 8-10-10 (12-12) sts mid front for 4-4.5-5 (6.5-7.5) cm = top piece. Gather 8-10-12 (14-16) sts up on each side of top piece and put sts from thread back on needle = 52-60-64 (72-76) sts. Knit 1.5-2-2.5 (3-3.5) cm of M.1, then P1 round with grey. Cast off all sts apart from the middle 8-10-10 (12-12) sts (= sts from top piece). Knit 9-10-11 (13-14) cm of M.1 over these sts = sole. Cast off and sew sole onto the sock. 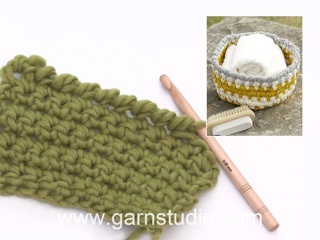 Crochet a string in chain st of approx 25 cm and pull string through row of eyelet holes. Hat circumference: 42-44-46 (48-50) cm. Knitting tension: 22 sts x 30 rows on needle size 3.5 mm in stocking st = 10 x 10 cm. Garter st on circular needle: 1st round: K. 2nd round: P.
Cast on 92-96-102 (106-110) sts on double pointed needles size 3.5 mm with off white and knit 2 cm garter st. Then complete in stocking st. When piece measures 15-17-17 (18-19) cm cast off. Fold the hat flat and sew tog at top (sew in over-cast sts from RS so seam is neat). Create 2 tight pompons with a diameter of 5 cm and sew them onto each end of the seam. Ear flaps: Cast on 3 sts on needle size 3.5 mm and knit garter st. Inc 1 st each side on every other row: 8-8-9 (10-11) times as follows: Right side: Knit 2 sts in first st. Left side: knit 2 sts in second but last st = 19-19-21 (23-25) sts on needle. 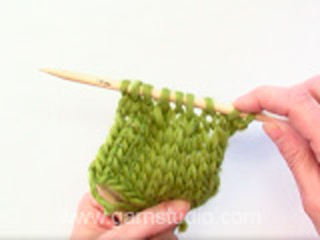 Knit until piece measures 7-7.5-8 (8.5-9) cm, cast off. Assembly: Double garter st edge at bottom of hat towards RS. Now, sew on ear flaps on last garter st row before stocking st with 9-10-10 (11-11) cm between them mid back.